A few weeks ago I had a craving for a new TV show to binge-watch on either Netflix or Hulu+. Something with swords, shields, and battles. Lots of battles. Several of my friends recommended Vikings on the History Channel, and I'm so glad they did since this show is awesome! This is what television was made for: epic battles, fierce winds on the high seas, dark and gritty religious rites. To compound all the Viking-ness that was coming through the TV, at the same time I was making a run at finishing The Banner Saga, a turn-based RPG by Stoic Studio. If you aren't familiar with the game, I suggest watching this trailer. Tell me that doesn't look amazing. The game feels like a blend of Oregon Trail, Fire Emblem, and an incredible cartoon from my childhood. You can show me all of the big releases at E3 2015, and not one of them excites me as much as watching the trailer for The Banner Saga 2, or booting up Darkest Dungeon for the first time this past week. Since I use movies, television, and video games to feed into my main hobby - tabletop RPG's - it didn't take me long to start thinking up ways to have a Viking experience at the gaming table. Not sure if I'd want to go for a full campaign or just a one-shot, I thought I'd begin small and just see where the winds, and our oars, took us. I started playing role-playing games in the early 1990's, and my mom was awesome enough to get me a subscription to Dungeon Magazine when she saw my growing interest in the role-playing hobby. One of my favorite adventures from this era was Isle of the Abbey by Randy Maxwell, as featured in Dungeon Magazine Issue #34. Designed for use with the D&D Rules Cyclopedia (quite possibly my favorite D&D product of all time), Isle of the Abbey is a low-level adventure generic enough to fit into any fantasy campaign. Author Randy Maxwell recommended that 4-6 characters of 1st to 3rd level could handle this adventure, and I would agree, although 1st level characters would have a very difficult time with certain parts. Isle of the Abbey can easily fit in any setting, so long as there is some reason to place a cloister, church, or temple on the middle of a tiny island. 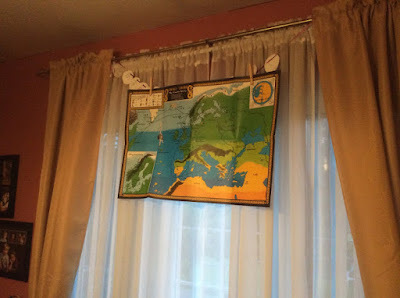 When I ran this adventure as a thirteen-year old I just placed it off the coast of my home-brew campaign setting, a land called Hyler (probably named it that because of its similarity to "Hyrule"… I wasn't that original.) Back in 2012, when my 4th Edition D&D campaign was winding down our group was considering a jump back to AD&D 2nd Edition Dragonlance. I wanted to use a few low-level adventures form my childhood to kickoff the campaign, and Isle of the Abbey was on my list, to be placed in the Straits of Algoni between Southern Ergoth and Abanasinia. That group ended up disbanding, and so Dungeon Magazine Issue #34 returned to my vault. Even though this Viking game was probably going to end up as a one-shot, I wanted to inject a little setting material to give the adventure some Norse-flavor. Thanks to TSR's Historical Reference 1 (HR1), Vikings Campaign Sourcebook, this was very easy to accomplish. 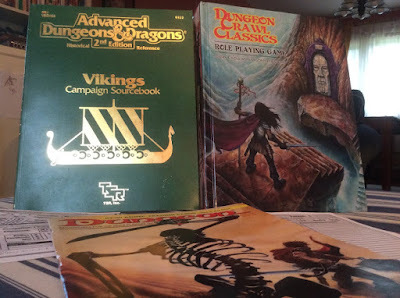 Historical timelines, Viking names, rune magic, Norse-mythology, this classic 2nd Edition book gives a GM everything he or she would need to run an authentic campaign. What I love most about this historical reference is it's authenticity. HR1 doesn't depict Vikings as the stereotypical, horned helm, battle axe wielding berserkers. Sure you can play a berserker, and there are rules for that build, but HR1 takes the time to explore the world of the Dark Ages from the Viking perspective: dangerous, mysterious, and yet full of promise. 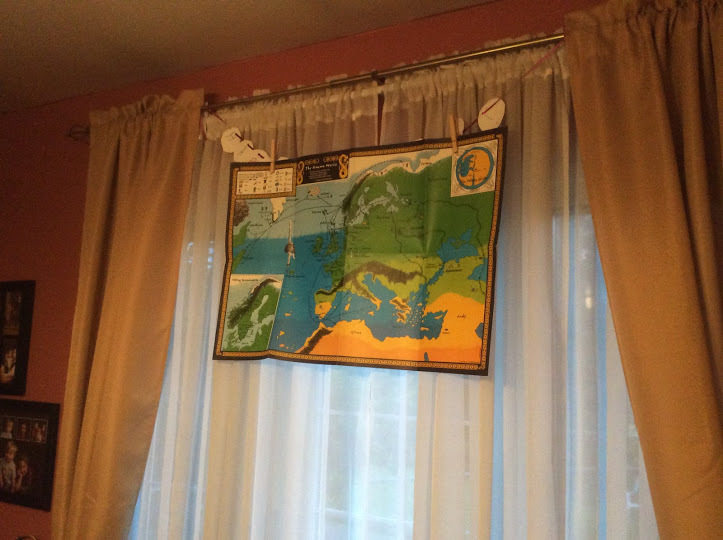 Given the awesomeness of the Vikings Campaign Sourcebook, I decided to making the Viking World of the 9th century our "campaign setting"… with a bit of a twist. The last choice I had to make was selecting a ruleset. 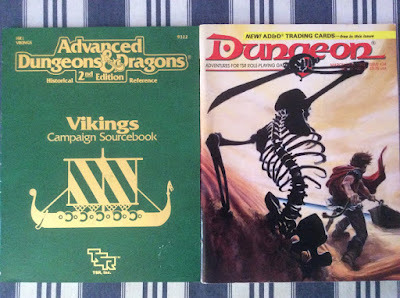 Isle of the Abbey is D&D Basic "native", while the Vikings Campaign Sourcebook was designed for AD&D 2nd Edition. But one of the reasons that I've fallen in love with OSR (old school renaissance) games and D&D Retro-clones is that I have several to pick from when running something from the "classical era." Everything out there is cross-compatible! 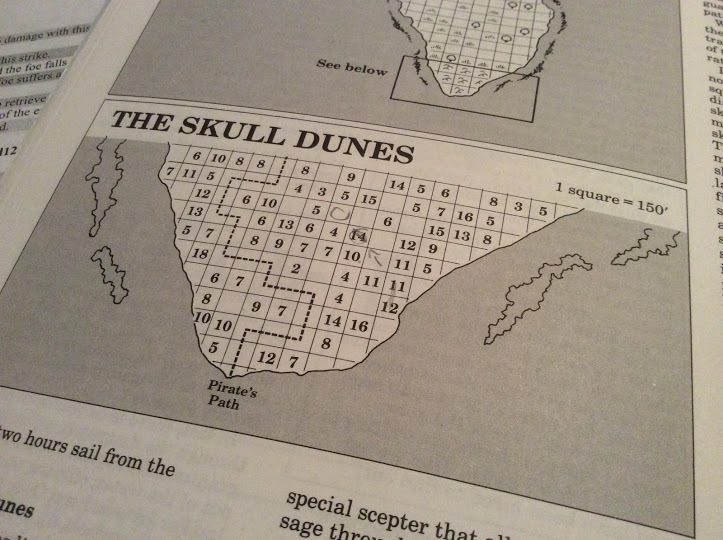 Even back in the day, AD&D 2nd Edition to D&D Basic conversions were simple. Just a few quick tweaks and you were on your way. 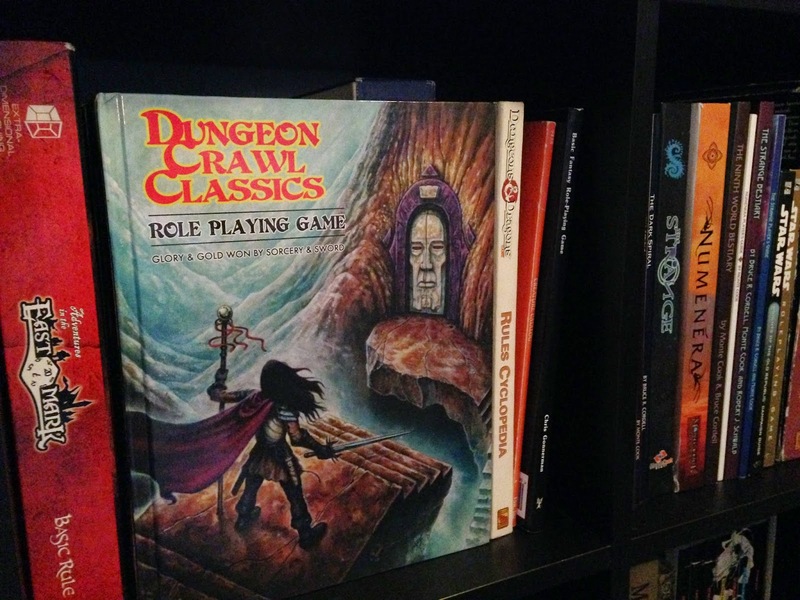 Running a game with the D&D Rules Cyclopedia is on my list of "things to do in 2015", but I shelved the idea for now. The group of gamers I assembled for Isle of the Abbey were all familiar with Dungeon Crawl Classics, and frankly any excuse I can get to roll those weird dice is fine with me. 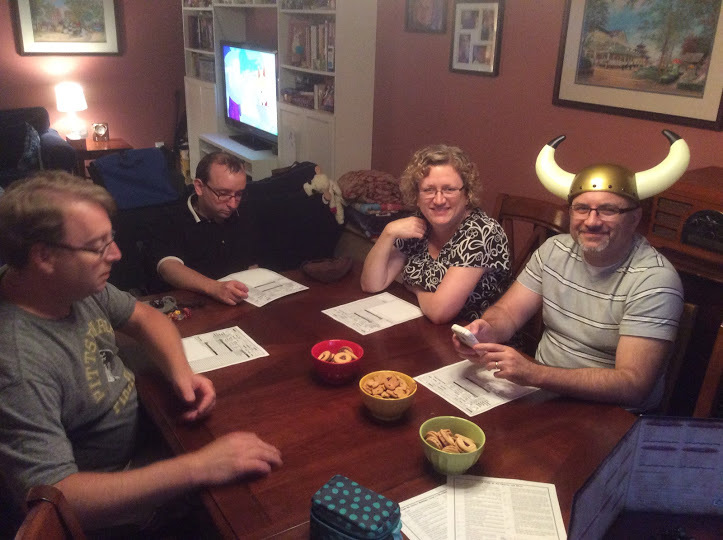 Four of my players (Jen, Andy, Cheryl, and Ed) took part in That 70's Game, an event this past February when I ran Sailors on a Starless Sea for a group of players dressed in their best 70's garb. 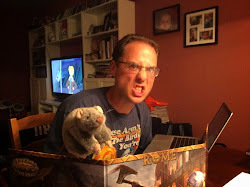 My buddies Andy and Craig both belong to my Tuesday night online gaming group, and we used DCCRPG in our Quattro con Carnage experiment back over the holidays. 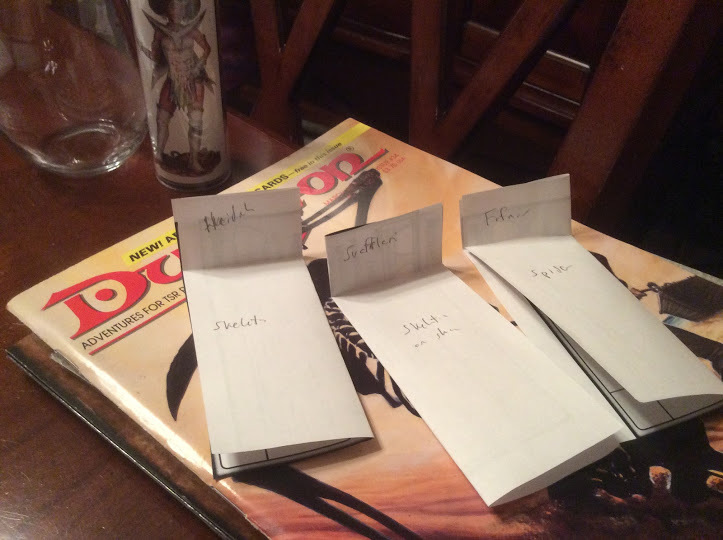 Using Purple Sorcerer Games' Upper Level Character Generator each player could pick from a randomly generated 1st level Warrior, Thief, Wizard, or Cleric. Only one 1st level character per player. Since I'm not completely heartless, and I know how deadly OD&D and DCCRPG are, I gave each character two randomly selected 0-level "attendants," each generated from the 0-Level Character Generator. Although "authenticity" in a fantasy game isn't necessary I did have a few restrictions. No dwarves or halflings, and elves would only be allowed as attendants, not 1st level main characters. Even though everything was generated randomly, everyone was very pleased with what Purple Sorcerer Games created. Frankly, I was really surprised at the power of some of the characters, and we lucked out with the virtual die-rolls! 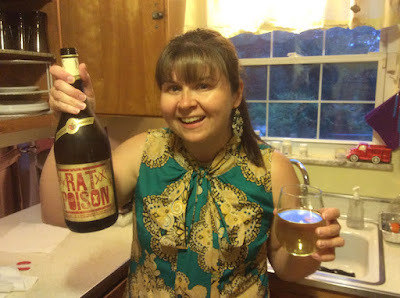 Jen opted for 70's garb again… and special wine. See those numbers? Each represents the number of skeletons popping up! Brienne surveyed the coast of this supposedly "cursed" island with grim determination. Located off the northern cost of Scotland, this two mile long, surprisingly plain lump of grass and stone seemed serene. This was the second excursion planned by Earl Ivar to this unknown island, the first having been a complete disaster, claiming the Earl's son. But the noble was under pressure to send out a second raiding party, and so he picked his least favored warriors to take part. Brienne and her raiding party would surely fail, the Earl thought, and thus end the clan's desire to explore this island. Selected as leader for this raid, Brienne was eager to prove her Earl wrong. The raiding party didn't know why this island was declared "cursed" when they set out, but upon arrival there certainly was an ominous feeling in the air. The only structure on the island was supposed to be a large Christian monastery, but when the Vikings arrived the structure was just a smoking wreck. Whether the work of another raiding party, an accident, or an "act of the gods," the promise of riches was still alluring, especially after several weeks at sea. Land the ship on the southern, sandy dunes of the island. … death was certainly in the air. The Vikings rowed their ship to the shore, and prepared to set out towards the monastery. Since she was the raid leader Brienne, short bow in hand, was the first ashore. As soon as her feet touched the coast, however, the sound of twelve creatures rising out of the sand nearly took her by surprise. Each of the boney monstrosities was the size of a man, possessing elongated fingers with claw-like talons at the end. Brienne let loose an arrow before climbing back aboard the boat as the rest of the party prepared to defend themselves. Four of the skeletons entered the waves while the remaining eight tried climbing aboard the boat. While the Viking leaders stabbed and slashed with their spears and swords, they quickly realized that piercing and slashing weapons had little effect on the skeletons, although Hildenoore's flames worked nicely. Through might and mettle the Vikings repelled their undead boarders, although it cost them poor Heidrick's life. The party searched the waves for the remaining four skeletons, but they were nowhere to be found. No matter, grabbing their longship, the crew dragged the vessel ashore. Since the bludgeoning weapons were working better than slashing or piercing, the raiders grabbed several of the skeletons' femurs to wield as clubs. There was some brief discussion of leaving a few attendants behind to guard the ship, but in the end Brienne decided to take everyone on their journey inland. Once everyone was assembled with their gear, the team of Viking raiders headed north. 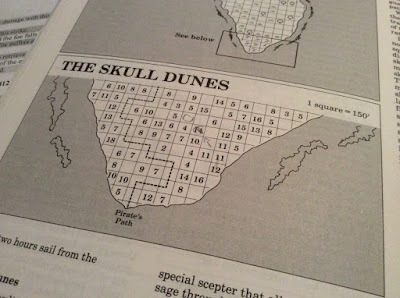 But as soon as they were two-hundred feet from the shore another eleven skeletons came up through the sand! Surrounded, the Vikings pulled together and defended each other. They were better equipped to deal with the threat this time. Using the holy might of Thor, Rolo repulsed half of the creatures, while a lit pot of oil thrown by Frelger's attendants set another two ablaze. Even though this encounter was brief, it still claimed another life. Poor Svafrlami had been torn limb from limb. The Vikings realized that there could be skeletons all over the sand, and so they set up a "Goat/Dog Reconnaissance Plan" to reveal the locations of other undead. Brienne was a herder, and had a fine sheepdog that could understand commands. Ulf had a goat. The initial plan was to send the goat ahead with a good slap on the rear, but the group realized that the animal would only travel a dozen feet or so before stopping. Hence the need for the sheepdog. The dog chased the goat, and the two ran out three hundred feet, revealing another fourteen skeletons. When Brienne recalled her herding dog, however, it ran straight through the fourteen skeletons and was torn apart. Sadly the dog died, but at least it revealed an important clue: the skeletons each guarded a specific area of the island, and wouldn't leave their guarded domains. It took several hours, but slowly the party made their way north, causing some more skeletons to appear, only to have the Vikings retreat to a safe part of the beach. Eventually they made it all the way through the dunes to the grassy hillside south of the monastery. But when Brienne looked back to the boat, nearly a thousand feet away, she noticed four familiar creatures on the boat: the skeletons! The creatures were standing on the deck, just waiting there for something to happen. No matter, Brienne thought, they'd deal with the problem when they returned to the boat. On their way to the abbey the party encountered a lone mule standing out in the sun. Frelger checked the beast for traps, and it appeared safe. Orr the Rutabaga Farmer seemed interested in another pack animal, so he fashioned a leather bridle and led the creature along with the rest of the party. Even if they didn't come back with any other "goods", at least the mule was worth some gold pieces. Once the Viking raiding party made it to the ruins of the old monastery they realized that the most of the structure had not only been set aflame, but also picked through thoroughly. There were organized piles of debris, and sorted remains of the old building. Everything that wasn't made of stone was either burned, melted, or complete ash. But there was still hope of reward. A lone staircase descended into what once was the basement of the structure, and there was a flicker of torchlight emanating from the dim chamber! Carefully Frelger descended the staircase, checking for traps, followed closely by Fafnir. But as soon as the Ditch Digger set foot on the staircase a giant, eight foot wide black widow spider tore out of a pile of rubble, sinking its teeth into the attendant! The rest of the party reared back, drawing their weapons. The combined might of the remaining raiders proved too much for the spider to handle. Although the creature fought to the death, it failed to cause any further injuries. With grim determination, the group returned their gaze to Frelger. With any luck the spoils of the abbey's basement would be worth the lives of three Vikings. Heidrick - Slashed to death by skeletons. Svafrlami - Torn apart by skeletons. Fafnir - Masticated by a giant black widow. CypherCaster Magazine - Cypher Fanatics United!